50 years on do the Droppers thoughts and ideals still have relevance? What might the idea of the ‘true life’ mean today? In what ways might we still be looking for the true life? Collaborative artist’s Ray and Webster propose to explore these questions in their project ‘Dropper’s.’ Referencing photographic archives from ‘drop city’ Ray and Webster will have built a geodesic dome inside the OSR Projects Space. 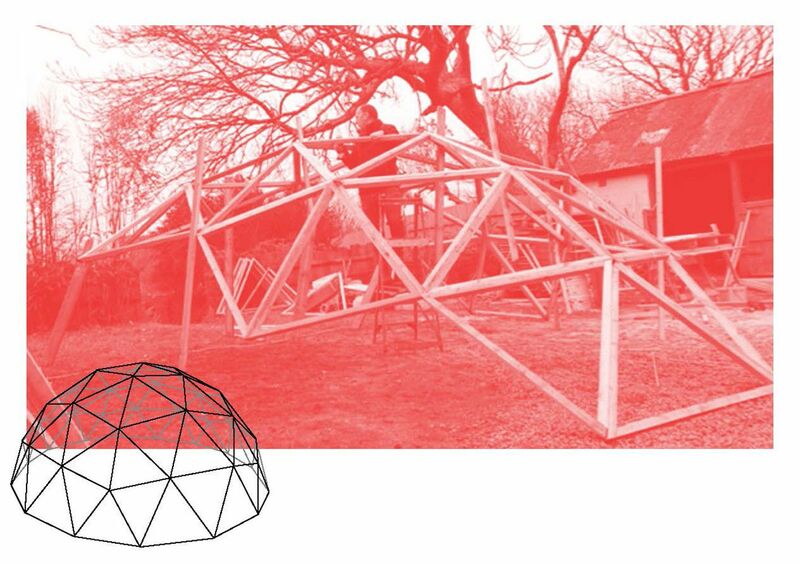 Salvaging materials, improvising the design and working collectively to fabricate and furnish the dome: it will be a focal point for happenings, events, discussions and activities to take place. They will be inviting members of the local community, schools and clubs, other artists, writers, poets and musicians to use the Dropper’s dome as a space to collectively examine the idea of ‘true life’. Born in Mansfield, UK, Andy has a doctorate in Fine Art practice awarded by the University of Arts, London, MA Fine Art from the University of Brighton, and BA Fine Art awarded by Manchester Metropolitan University. He works individually and collaboratively across sculpture, performance, moving image, sound and curatorial practice often in response to the characteristics, approaches, attitudes and metaphors associated with a particular site, context, or discourse. He has been the recipient of awards including in 2014: Sculpture Space Residency, New York, USA; Environmental Art Award, BigCi, NSW, Australia; 2013: Salina Artist in Residence, Kansas, USA; and in 2012: Art Omi International Artist Residency, New York, USA. Recent solo exhibitions include in 2013, Action, Salina Art Center Warehouse, Kansas, USA and in 2012, Dawn Chorus, Waterfront Gallery, University Campus Suffolk, UK, and, Unsustainable? Ruskin Gallery, Ruskin Anglia University, Cambridge, UK. Born in Redruth, UK, Darren has a BA (Hons) Fine Art from Falmouth University. He works across sculpture, performance, and moving image. Recent group exhibitions include: in 2015 – Arlene’s Solar Furnace, Goonhilly Village Green, Cornwall, UK; Falmouth Fine Art London, The Embassy Tea Gallery, London, UK; BA Degree Show, Falmouth University, Falmouth, UK; in 2013 – FISH FACTORY, St John on Bethnal Green, London, UK; The Art of Writing, CMR, Redruth, and Walthamstow, UK; Machine Made Man, Fish Factory, Falmouth, UK; in 2012 – TR-Fifteen, CMR, Redruth, UK; If not now when, CMR, Redruth. Residencies include 4 weeks 33 hours, Centennial activities celebrating John Cage, CMR, Redruth, UK. Producing artist-led projects that place people at the centre of artistic activity. Public involvement, conversation and the sharing of ideas are part of the natural vocabulary of OSR Projects. The work we do from the OSR Project Space in West Coker and further afield, crossing cultures, is a conversation starter; it engages people through its processes of thinking and making, as well as seeking out new and unexpected ways to have impact. Since 2011 OSR Projects have involved over 100 artists, writers, curators and cultural producers, delivering a programme of artist-led exhibitions and events that have provided a platform for contemporary visual art in rural Somerset and beyond. Previous projects have included exhibitions and events by practitioners at all stages of their careers; from emerging artists and collectives to established internationally exhibiting artists and curators.